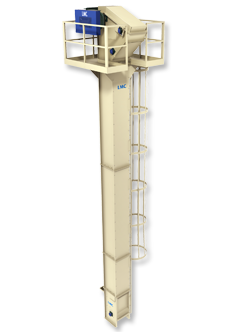 The principals of operation for an LMC Easy Dump Elevator are very simple, straightforward and effective. From a spouting system, the product is transferred into the buckets. The buckets travel up the legging until they are pulled around the first set of sprockets as shown in the illustration. The buckets are gently tilted and product dispenses into the discharge hopper. From this hopper the product feeds through a spout to your designated destination. The buckets continue in this cycle and provide a continuous, smooth flow of product with very little damage to the product.